Fit Wanderlust Runner: So You Ran A Marathon, What's Next? Running the Chicago Marathon was an absolute thrill. I had an amazing time and loved the course. Would I do it again? Of course...but not any time soon. You know how runner's get that high after their races and want to immediately sign up for the next one? Yeah that was NOT me after the Chicago Marathon. I guess that high only happens to me when I complete a half marathon. So it made me think, what's next? My coworkers think I am crazy for still wanting to run. What can I say I just love the sport! I just have a strong passion for running and I am glad that it hasn't dwindled. It's my stress reliever and I love it. I've been on a few runs here and there but haven't ran anything longer than a 10k since the marathon. However, I have noticed that my pace is getting faster! I remember looking down at my watch at the half way point of the marathon and being shocked at my time, 1:58. Since then that time has been in my thoughts. What if I train extra hard and try to get a 1:55 for my next half marathon? Sounds reasonable right? So that's my next goal...get a PR for a half marathon. *Disclaimer* Technically my "official" PR for a half marathon is 1:46 but my husband says that one doesn't count. I kind of agree with him and I kinda don't. That PR was for the Heavenly Half Marathon which is a complete downhill race in the mountains of Auberry, CA. Yes, the downhill helped tremendously but I was also in really good shape and was able to pull of that time due to all my training. But, in every other race I've ran I haven't even come close to that time. My next race is actually in the middle of January which gives me time to come up with a killer 12 week training plan to get that PR! 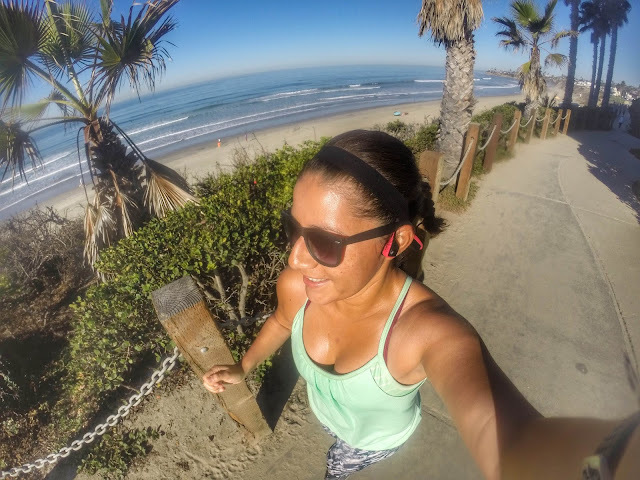 I'll be running the Carlsbad Half Marathon, a race I just love. It's a part of the triple crown which I am also planning on running next year. The triple crown consists of three of San Diego's finest running races. They are divided throughout the year with the last one being in August. I know getting multiple PR's a year is a bit tough so I am going to focus all my training on the Carlsbad Half Marathon. Another thing I signed up for doing next is running a Ragnar Race! Yep, that's right...as if running a marathon wasn't tough enough right? I'll be running the Ragnar SoCal with my fellow coworkers so it should be fun. Well the not sleeping part and running in the middle of the night doesn't sound fun but at least I will be with good company. The course is supposed to be really pretty with a ton of coastal views so I am looking forward to trying something new. Since my group consists of 12 runners, each with different levels of training, I am hoping this will just be an enjoyable race. I had thought about possibly putting my name in the lottery for the NYC Marathon, but I am going to wait on that for a bit. I think I am going to really focus on my upcoming half marathons and Ragnar. That should definitely keep me occupied for the majority of next year. So I guess that answers my question of what I'll be doing now that I finished a marathon! Pretty excited for what's to come. Stay tuned for glimpses into my training program but definitely follow me on Instagram if you want more daily pictures of how my training is going. Have you ever ran a Ragnar race?